Earnings Preview: Is Macy's Turnaround on Track? The department store giant has warned investors not to expect a repeat of its strong first-quarter results. But did it beat its own modest expectations -- and analysts' slightly more bullish forecasts -- in the second quarter? Three months ago, Macy's (NYSE:M) reported surprisingly strong first-quarter results. 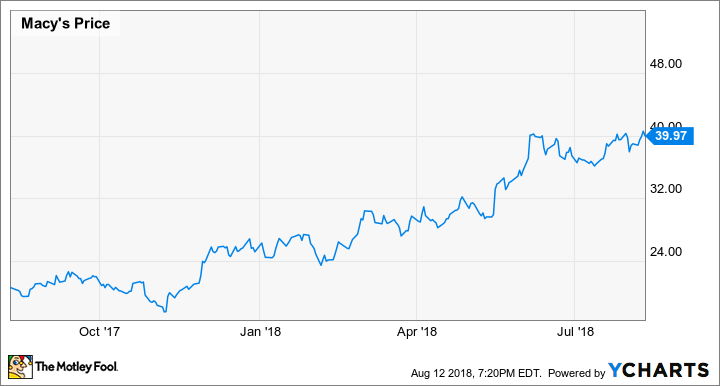 Comparable-store sales surged 4.2% year over year -- helped by the timing of a major sale -- and adjusted earnings per share nearly doubled to $0.48 from $0.26 a year earlier. The solid sales increase and huge improvement in earnings helped Macy's stock continue a rally that began in late 2017. Shares of the iconic department store company have more than doubled since last November and have risen 35% in the past three months. Macy's Stock Performance, data by YCharts. This is the backdrop for Macy's second-quarter earnings report, which will come out on Wednesday morning. While Macy's stock is hardly expensive, it's not nearly as cheap as it was just a few months ago. The company will need to show continued turnaround progress to keep the stock moving higher. Macy's management estimated that the timing of the company's annual friends and family sale boosted comp sales by about 2.5 percentage points in the first quarter. On Macy's first-quarter earnings call, CFO Karen Hoguet estimated that the timing of this sale would reduce Q2 comp sales growth by 2.4 percentage points. As a result, Macy's guidance calls for a modest year-over-year sales decline in the second quarter. However, many other retailers have suggested that sales trends would improve sequentially in the second quarter, as severe winter weather pinched sales in February and March. Additionally, the preliminary U.S. retail sales reports for May and June were quite strong. This means there could be some upside to Macy's second-quarter sales forecast. Macy's provided a very conservative forecast for the second quarter. Image source: Macy's. Indeed, analysts expect total sales to be roughly flat year over year in the second quarter, which would imply positive comp sales growth. (Macy's closed a handful of stores in early 2018, so it would need higher sales in the remaining locations to keep total sales flat.) Analysts expect EPS for the second quarter to inch up to $0.50 from $0.48 a year ago. One interesting question is whether Macy's saw any benefit from Bon-Ton's bankruptcy during the second quarter. While the two retailers' store bases have limited overlap with one another -- only a third of Bon-Ton's stores are within 10 miles of a Macy's location -- they carry similar merchandise. Furthermore, Macy's strong e-commerce business should allow it to target even those Bon-Ton customers who don't live near a Macy's store. Bon-Ton began liquidating its stores in late April. Typically, a liquidating retailer could steal traffic from rivals in the short run due to big clearance discounts, before going out of business and putting its market share up for grabs. However, Bon-Ton's liquidators initially offered very stingy markdowns. During the first nine weeks of the second quarter, Bon-Ton sold just $238 million of inventory. For comparison, during the second quarter of fiscal 2017, sales exceeded $500 million. While Bon-Ton's sales probably accelerated in July due to bigger clearance discounts, rivals like Macy's still could have benefited on average last quarter. While Macy's operating results will get the bulk of investors' attention, the company is also making slow but steady progress toward monetizing excess real estate. In the long run, Macy's Manhattan flagship store is its biggest opportunity to cash in on high property values. However, in the short term, its San Francisco flagship store is the key focus. During the Q2 earnings call, Macy's may provide an update either on the planned sale of the I. Magnin building -- a 240,000-square-foot portion of the San Francisco flagship store -- or on a plan to lease out 10,000 square feet of prime street-level retail space in the front of the store. Macy's plans to monetize part of its San Francisco flagship store. Image source: Macy's. Investors will also learn how Macy's is using its growing cash pile: It ended the first quarter with $1.5 billion of cash. Management has indicated that debt reduction remains the top priority, but Macy's is already approaching its long-term leverage target. As a result, it could resume stock buybacks within the next few quarters. While analysts seem to expect Macy's to beat its sales guidance in the second quarter, they still expect the company's full-year results to be within its guidance range. The average EPS estimate is $3.87, compared to Macy's updated full-year guidance range of $3.75 to $3.95. Thus, there are several reasons for Macy's shareholders to be optimistic about the upcoming earnings report. Still, the stock's big rally over the past year leaves it vulnerable to a big drop if the company didn't execute well last quarter.